I’m brand spanking new to Special Needs – sort of. For over a decade I’ve raised my children with friends who have Special Needs, loved Special Needs families, walked with friends through challenges with their children, and developed a heart of compassion and love for these wonderful families. However, I didn’t know I had a Special Needs child in my home until now. His delightful brand of different brings our family joy every day and a lot challenges. Somehow in all the busyness of life, we didn’t recognize his uniqueness as “Special” until we hit roadblocks in educating him at home. My child, who is almost eight, hasn’t changed, but my understanding of who he is and how he operates has dramatically changed. This brand new understanding brings a whole world to my door that I have only been an observer to for the past decade. Now I am wading into terminology, therapists, doctor appointments, schedule reroutes, curriculum questions, doubts, and fears that leave my head and my heart spinning. Many of you have already walked this road; others, like me, are just beginning the journey. So, what does a family need as they begin walking forward with a Special Needs child? Those of you who have experience with this can be a comfort, encouragement, and source of strength to families who are new to this wonderful, special world. What helped your family mentally and emotionally adjust to the demands on your time, relationships, and emotions? When you discussed your child with doctors, therapists, family, and friends, what attitudes and information from them most encouraged you and set you on the right track? How did you talk about the challenges of Special Needs to the other members of your family? What information would have been most helpful for you to have as you made choices about homeschooling and Special Needs? How did you find the support you and your family needed to navigate the Special Needs in your home? We are still in the beginning stages of meeting with a Developmental Pediatrician, navigating a diagnosis, and talking to therapists. Already, I’ve learned so much. Here are a couple nuggets of wisdom I’ve gained over the past few months about beginning the journey of educating a Special Needs child. For every diagnosis, there are a thousand ways that it manifests in each unique child. The lists of therapies, curriculum, methods of instruction, and schools of thought on medicine vs. natural treatment seem infinite. The people who have been the most helpful to us have provided explanations and facts along with the possibilities of how different solutions would benefit our child. They do this with grace, patience, and understanding without pressuring us to choose a particular path. What a relief! Armed with information, we can pray and think through the best path for our family. This is not always the case, though, and we can walk away from these meetings overwhelmed by the decisions facing us and weighed down with shame, guilt, fear, or loneliness. This led me to our next need! One of the benefits of being connected to a support group like SPED Homeschool is the rich community of people who can provide counsel, wisdom, encouragement, fresh perspective, and a sounding board of ideas. When I posted a question on the Facebook group, one mom reached out to me privately and offered to meet up at a park. One of her children faces similar challenges to my youngest child. It was such an encouragement to hear her story and be reminded that there are so many other beautiful families in the trenches together. Whether you are in the early stages in your journey or a seasoned Special Needs mom, your story matters. When you share what God has taught you and where you have walked, it offers comfort and courage to others. Be bold, friends, and reach out to someone who needs some encouragement! “Wouldn’t it be nice if our children came with an Instruction Manual?” I’ve heard this laughingly asked many times by many people over the years. And just in case you weren’t sure – No! There is no manual. However, by God’s grace, we are given the wisdom we need to parent our children. Navigating the Special Needs world, however, is challenging. A road map would be helpful. From terms like IEP to ARD meetings, the difference between OT and PT, or where to seek a qualified diagnostician, we need help! Thankfully, many of these questions can be asked and answered through the SPED Homeschool Support group on Facebook. There are many resources on the website for those just beginning the homeschooling journey, and team members more experienced than I am who are at the ready to answer your questions. Finally, my greatest need as a mom rerouting into educating a Special Needs child is grace. This is going to take time, prayer, patience, and a lot of love. Some days I just don’t know what in the world to do because I’m too exhausted and frustrated to try anything else. Other days I ready to take on the world for the sake of my son but don’t know where to start. So, I need to give myself some grace to accept that I don’t have all the answers, but God has gifted this wonderful child to me for a time to love and disciple. There are plenty of people who don’t understand our decisions or my son, and I need to give them grace too. Every step of the way, every day, God is providing for us and leading us in the paths we should walk. I am so thankful for this adventure! 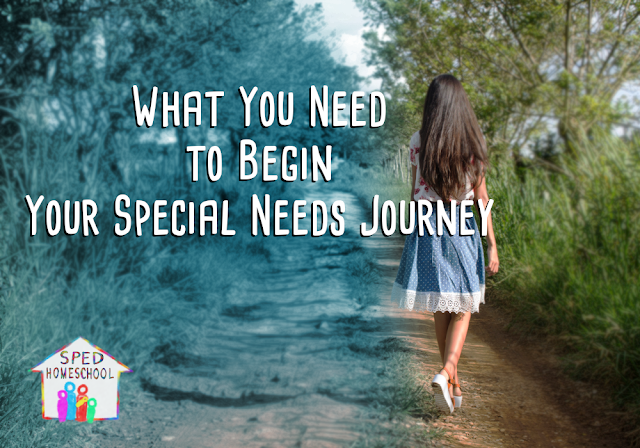 What do you need today as you begin your Special Needs journey? Join our support group and let us know. Loved this. As a parent of a 13yo with multiple "invisible" disabilities I want to encourage everyone to learn the laws that protect your children. Because at some point you will likely need them. Look up Wright's Law. Pete Wright has written great books for parents. If at any point you end up needing to go back to public school make sure you have a strong IEP, especially for big transition years. Contact an IEP Advocate for help, they are often free. Great advice! It's a good reminder to be knowledgeable about the laws related to our children and educating them at home. We have been discussing IEP's as a SPED Team and how to help families plan one for their children. Our oldest child is 13yo also, and that transition to High School is a big one! I appreciate your comment – thanks for sharing!